The issue of werewolf is inexhaustible not only in literature and cinema, but also in games. The plot is quite standard: somewhere people are disappearing and then their dead disfigured bodies are found. Afterwards the rumors about a werewolf hunting the people spread. 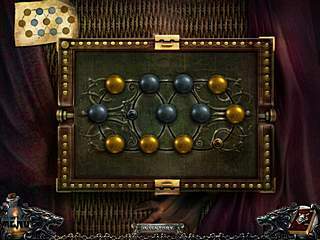 That's right the case of the new game by ERS Game Studios named Shadow Wolf Mysteries: Curse of the Full Moon. Having played the other bestsellers of the game publisher such as Haunted Halls: Green Hills Sanitarium, Haunted Legends: The Queen of Spades, Dark Tales: Edgar Allan Poe's Black Cat and some others personally I treat the ERS' bunny depicted in the logo as a quality mark. And I have never been disappointed. The HOG-scenes are made in junk pile style and seem to be very crowded, but the objects are clear and have normal sizes. 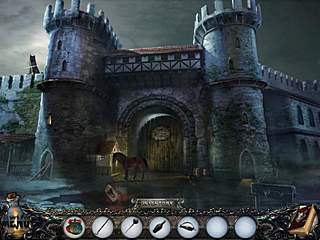 Shadow Wolf Mysteries: Curse of the Full Moon follows the formula that ERS Game Studios seems to master so well: melancholic, gloomy iHOG with strong Adventure gameplay and the puzzles that have become classics already (most of them want you to rotate the elements). The storyline has no twists but it is well developed. Being a detective you come to some countryside from the capital. All the actions take place somewhere in England in 19th century, as far as I got the idea. So there have been several deaths in the surroundings as of late, and an increase in wolf sightings. As a result, the locals have begun whispering werewolf amongst each other. And your task is to reveal the truth behind these attacks. Actually the game starts with an animation: you're the witness of some creature attacks a rider, the scared horse runs away and you start your investigation meeting the first character to interact. Gerard tells you the reasons you were asked to come and becomes the one you'll meet rather often on your way telling you some new details concerning the case but even more often – brining you the bad news. Talking about the interactions in the game it is impossible to avoid the discussing of the voice acting. The experienced players might carp at this aspect of the game. For example the fortuneteller Madlen makes some mistakes pronouncing the words. But on the other hand, hardly fortuneteller could be the native English speaker as these kind of people are usually of Gypsy origin. So you must agree that this kind of peculiarity in Madlen's speaking brings some reality to the scenes. Besides voice acting can be named the only one shortage of this gorgeous game and will not spoil the general impression for sure. By the way there were some cute details in the game plot that made me sarcastically smile. For example Madlen constantly repeats that you should stay away from the wolf in the open-air cage. And of course you understand that it is your destination point. But in order to get into the open-air cage you have to saw off the barrels. Guess where you will find the saw? Right in the same place where the fortuneteller sits. So the general situation is that you need to open the open-air cage secretly but you take the instrument from under Madlen's very nose. The HOG-scenes are the basics of Shadow Wolf Mysteries: Curse of the Full Moon. They are junk pile style and very crowded, but with clear objects in normal sizes. The list of the objects to find is made in two colors. The items that are written in yellow are not placed in the foreground – they are hidden inside of something or you'll have to do something before you get the needed object. For instance in the circus area you'll be asked to find a rabbit. Be sure it's in the hat. Or in the other scene the green heart will be listed. The only one heart that is available there will be red. But after careful examinations you'll see the green paint so that the only thing you're expected to do is to drop the container with the paint on the heart. Even if you get stuck looking for a cup that will turn out to look like a glass, the hint button is an easy way out – don't forget about it. Rambling back and forth (this iHOG is non-linear) will take you more than 4 hours. And extra 45 minutes will be needed for the bonus chapter that is the obligatory thing to progress through. Otherwise you'll feel as if the game has no logical ending. All the locations you're expected to explore have a lot of detail and their own challenges, which is a wonderful thing (if you like point&click, of course). Don't neglect the journal as it holds clues to this, as well as important details of the story. 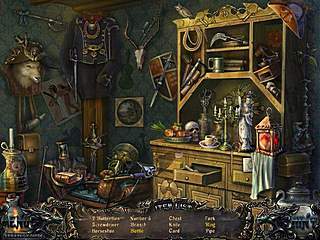 The graphics of Shadow Wolf Mysteries: Curse of the Full Moon are wonderful. But when it goes about the ERS Game Studios' games it is not a surprise. I enjoyed every detail, especially the hint button that had a form of the moon and while recharging changed from the thing moon to the full moon. By the way the process didn't take much time. I wouldn't recommend the small kids play the game as some of the pictures were rather unpleasant, especially those ones with the murdered people. But there is no other cons when it goes about buying Shadow Wolf Mysteries: Curse of the Full Moon. This is Shadow Wolf Mysteries: Curse of the Full Moon review. Download this game here.